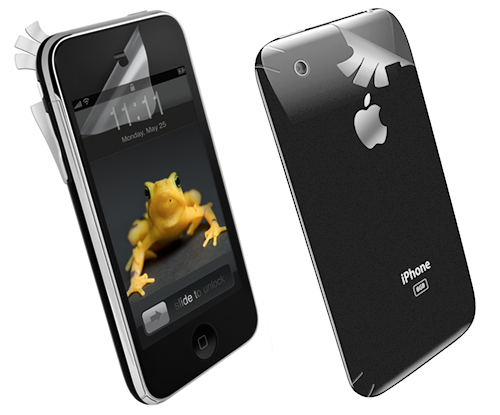 Wrapsol ultra is, at least according to its maker, “The world’s strongest, easiest and fastest-to-apply drop + scratch protection system for the Apple iPhone 3GS.” Put another way, it’s a transparent precision-cut film coating that protects your iPhone. And I would use InvisibleSHIELD or a similar protection product exclusively except for one little thing: I review a lot of iPhone/iPod/iPad cases. Unfortunately, when it comes to most cases, it’s an either/or proposition — you can use either a traditional protective case or a protective film, but not both. That’s because the film products make your iPhone a lot less “slippery” than a naked device, and add a fraction of an inch on all sides. The bottom line is that once you apply a film product (and I’ve tested a few), your iPhone won’t slide easily (if at all) in and out of tight-fitting cases, certain iPhone batteries, and some peripherals with tight-fitting docks. …well I just had to give it a try. It’s similar in many ways to the InvisibleSHIELD product I like so much. 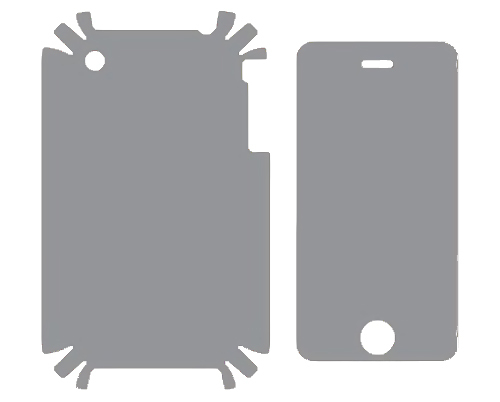 The precision-cut film for the front and back of the iPhone looks pretty much the same. The biggest difference is that InvisibleSHIELD products are use a special spray solution that makes it a bit tricky to apply. You have to turn off your iPhone, spray the solution onto the film, position it carefully on your iPhone, squeegee out any air bubbles, and then they let it sit overnight (12-24 hours) before you turn it back on. Here are a couple of pictures of what the film looks like. The first shows how you apply it; the second shows what the two pieces of film look like. Wrapsol ultra uses a dry application process that’s faster and easier, and doesn’t require any “drying” time so you can use your iPhone immediately after its application. When I say, “easier,” what I really mean is, “much, much easier.” Doing a great job of installing InvisibleSHIELD (or any other film that uses a wet application process) can take 20 or 30 minutes, easy. And it sometimes requires holding the corners in place for several minutes each to help them cure properly. The Wrapsol ultra application, on the other hand, took less than 5 minutes and didn’t require me to hold down the corners at all. The special “air-bubble releasing adhesive” and the included squeegee and microfiber towel made it the easiest film installation I’ve ever performed. And it looks better than other film applications I’ve done, with no visible air bubbles or other imperfections. Other “wet” applications I’ve performed have had at least one or two small (but annoying) bubbles or other imperfections. It turns out that the Wrapsol ultra is even more invisible than the InvisibleSHIELD. Go figure. As I said in my NuGuard Clear review last week, “I’d do a lot for you, gentle reader, but I have to draw the line at drop testing or blender testing.” So I can’t tell you if the Wrapsol ultra will actually protect your iPhone from a six-foot fall (as claimed in the press release). I did ask the PR person if they would lend me an iPhone and let me drop it from six feet, but she declined. I will say that the Wrapsol film does feel thicker than other film products and probably provides more protection than InvisibleSHIELD, BodyGuardz, and BestSkinsEver (the three other film products I’ve tested). Finally, three things make me feel warm and fuzzy about recommending Wrapsol products. We guarantee everything we make. If one of our products does not perform to your satisfaction or it becomes damaged due to wear and tear, simply return it to Wrapsol for a replacement. Full refund policy. If you don’t agree that Wrapsol is the best product of its kind, you are welcome to return it within 45 days for a full refund, including any shipping charges. All Wrapsol products come in recycled, reusable and 100% recyclable packaging. Wrapsol makes a donation to Cool Earth, a non-profit organization that helps protect endangered rainforests world-wide, for each protection system it sells. There is one last thing: I’d really love to drop an iPhone from 6 feet to see if the Wrapsol ultra really does live up to that claim. I’d even videotape and post the experiment to YouTube. So if you’ve got an iPhone 3G or 3GS you’re willing to sacrifice, I’ll gladly pop for the $29.95 for a new Wrapsol ultra and send the phone back to you at my expense too (regardless of its condition). Contact me via email (macobserver@boblevitus.com) if you’ve got an iPhone you’re willing to contribute. Wrapsol ultra is probably the best film product I’ve ever applied to my iPhone and certainly the easiest to apply. As long as you can live with an iPhone that won’t slide in and out of tight-fitting cases, certain iPhone batteries, and some peripherals as easily as a naked iPhone, Wrapsol ultra is as good as it gets. Easiest film I’ve ever installed, no air bubbles after installation, slightly thicker than other film products so it may protect somewhat better. iPhone won’t slide easily in and out of some cases and peripherals.